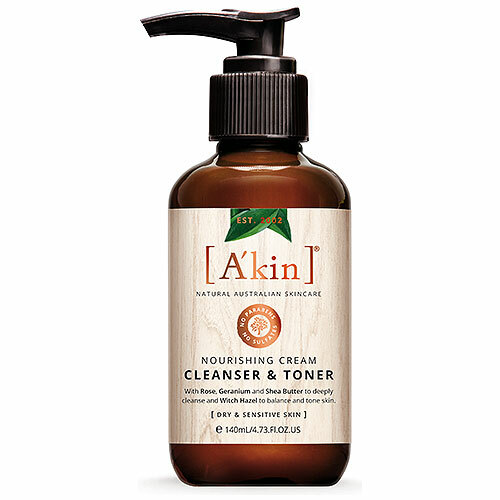 A cream cleanser with Rose, Geranium & Shea Butter to deeply cleanse and Witch Hazel to remove make-up and impurities, and balance and tone skin. Morning and night, apply a small amount onto your fingers and massage gently onto your face and décolletage. Rinse or tissue off. Below are reviews of A kin Nourishing Cream Cleanser & Toner - 140ml by bodykind customers. If you have tried this product we'd love to hear what you think so please leave a review. Beautifully soft and easy to massage in. Use with cotton wool or a damp face cloth. Excellent cleansing and skin left feeling very moist. Excellent in every way. Cleans, softens and moisturises the skin with its creamy consistency. Would highly recommend. This is the best all round cleanser I have ever used. It suits my dry, sensitive but easily congested skin and is very soothing and cooling on application. I massage into dry skin morning and evening and remove with a muslin cloth or soft flannel wrung out in warm water, then I rinse with tepid water. After use my skin is left soft,brighter and toned. From time to time, I try something new, but end up coming back to this gorgeous cleanser which is delicately scented with rose geranium.The price is fantastic and the delivery is amazing (and free!). I usually order over the phone and the service is always excellent. I can highly recommend this product and this company.